Daimler Financial Services finances, insures, and leases Daimler Group passenger cars and commercial vehicles in more than 40 countries around the world. More than 15 million customers use its various brands, including Car2Go, MyTaxi, Blacklane, and moovel. Daimler fosters an environment where employees feel engaged and connected to their work, to each other, and to the goals of the organization. At Daimler Mexico’s all-employee offsite, all teams presented their work and had the opportunity to listen and learn from one another. This event helped to show the impact the work of each team has on others, and how all of their efforts impact the overall business. In Austria, the company has a Great Place to Work Team that consists of employees who are representatives of their respective departments, a member of the Executive Committee and Human Resources. Every two weeks, the group convenes to discuss matters of importance identified by employees and works together to define solutions and initiatives that will help improve the employee experience. The DaSH Program (Drive a Star Home) gives employees the chance to take an exclusive Mercedes-Benz vehicle home for a few days. Employees are nominated by an executive or by their peers for outstanding performance while on the job. They are then able to take a vehicle for a weekend or a full 5-day work week. Each DaSH winner is encouraged to take photos of the experience, which are then displayed on plasma screens throughout the office. 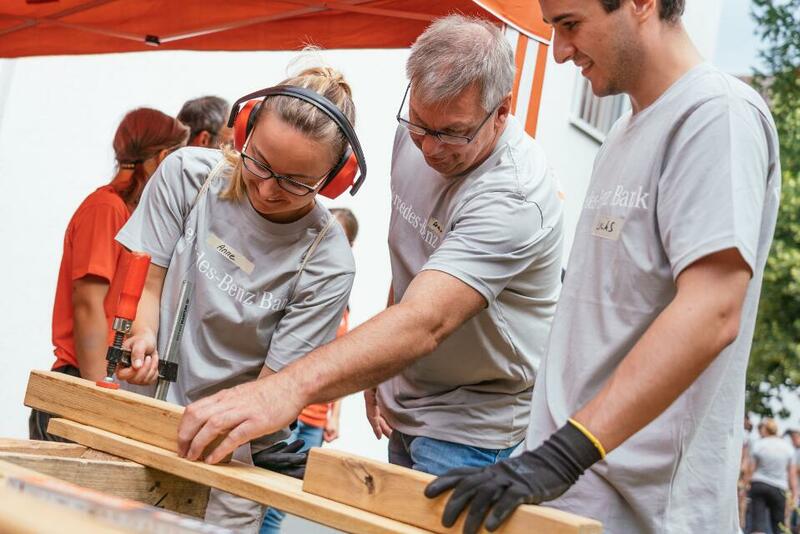 The company gives back to the community through its annual Day of Caring. Last year, the team in Mexico hosted workshops on a variety of topics, like screen printing, and they worked to create a community garden that will benefit a local neighborhood. Find out about job opportunities at Daimler Financial Services on its careers page. "Daimler gives us the opportunity to grow on a personal level, we are treated equally and with respect, it enables us to do our job. It’s more than a place to work, it’s our second home." "Open and transparent climate. The level of communication and participation in company life has increased enormously (townhall, management meetings, councilor for a day, celebration of company successes, etc.). There is room for anyone who wants to express their ideas and good ones are normally sponsored and carried forward. Non-punitive attitude towards those who make mistakes. "There is always a drive towards excellence ... and this is a great stimulus as well as a source of pride. There are continuous projects, challenges to be faced and positive results are always celebrated, giving value to the work done by people."